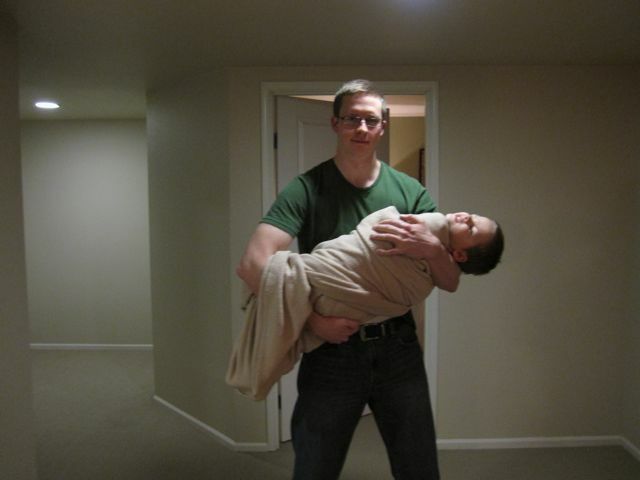 Gareth hasn't been swaddled since he was three months old. The other day he was asking to be wrapped up in his orange blanket, but Ryan discovered that it's now far too short to really wrap him in. So we pulled out a blanket that was in the closet here. And it turns out it's big enough that you can swaddle and almost-four-year-old in it! Gareth did manage to wriggle out of the blanket, but it took quite a bit of work on his part and some encouragement on ours. 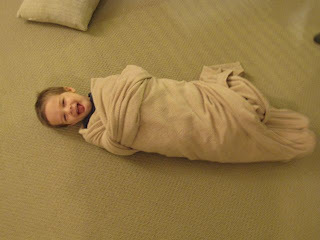 He thought it was great fun and was begging to be wrapped again before bed. I, not wanting to deal with a mess should he need to use the bathroom during the night, talked him out of that one. I love it! That looks like so much fun! Good thinking on not letting him sleep in it. I'm impressed you were able to talk him out of the idea. Nice work! That's hilarious. I wonder if all kids go through sort of a "second babyhood" at some point. Sylvia's recently gotten into walking around with a pacifier in her mouth. She's used a pacifier in the last few months far more than she ever did as a baby!